In late 1934 Walter Gropius left Nazi Germany with his wife, Ise. Taking up Jack and Molly Pritchard’s offer to stay in one of their Isokon flats, at Lawn Road in Hampstead, Gropius joined Maxwell Fry in a partnership that would last until his appointment at Harvard University in 1937. Fry and Gropius worked with Jack Pritchard on a series of projects for Isokon buildings – at sites in Manchester, Windsor, and Birmingham – although all went unrealised. The ‘Isokon 3’ scheme at St. Leonard’s Hill on the outskirts of Windsor was the most developed of these and featured in a 1935 article entitled ‘Cry Stop to Havoc – or preservation by development’ by the Architectural Review. The article’s alarmist title reflects contemporary debate regarding the spoilation of the English countryside by suburban sprawl, which new organisations such as the Council for Preservation of Rural England sought to address. 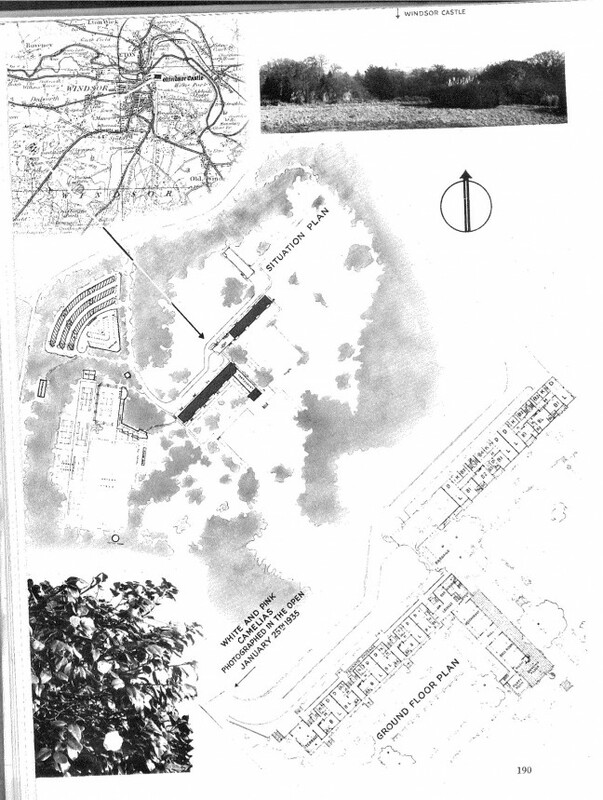 Fry and Pritchard were familiar with such ideas through their involvement with the Design and Industries Association, and used this debate to push forward their plans for a modernist development; as Pritchard wrote, Isokon aimed ‘to make a profit from building in the country without spoiling the countryside’. Page showing ground floor plan of Isokon 3, from ‘Cry Stop to Havoc’, Architectural Review, 1935. Situated amidst 33 acres of parkland of a ruined Elizabethan country house, the article demonstrates how the Isokon 3 development might preserve 32 acres of the park as open space. With the historic setting and views out towards Windsor Forest, the combination of English heritage and modern European architecture was promoted as unique. The AR article is full of photographs of existing camellia bushes and references to Eton and Windsor Castle, alongside seductive sketches of light, airy rooms with unobstructed views. Pritchard wrote: ‘The combination of Gropius and Fry should be important … Fry’s own very English point of view combined with Gropius’ experience should produce a fine scheme.’ This anglicization of Gropius’s Bauhaus ideas was a canny move and the scheme was given approval – unlike many modernist projects of the period. However the company was unable to raise the necessary funds, despite Pritchard’s best efforts, and Isokon 3 remained unbuilt.